In classical music programming, repetitions of repertoire are supposed to be a bad thing. We are to reel at the idea of more than one instance of Beethoven’s Appasionata sonata, or shudder at two Death and the Maiden quartets by Schubert in one season. Whilst providing artists the freedom to choose their own repertoire and encouraging adventurous combinations of works is a central principle of the Sunday Concerts series, if the same piece of music appears on two concert programs it can also provide a welcome moment of reflection on the various aspects a piece of music can possess. Would we begrudge van Gogh his several iterations of the Postman Roulin if his subject matter and artistic process were not so fascinating? We can certainly lament their departure from the galleries of the Phillips, where several have lived in such happy juxtaposition during the recent Van Gogh Repetitions exhibition. So it can be with music too. 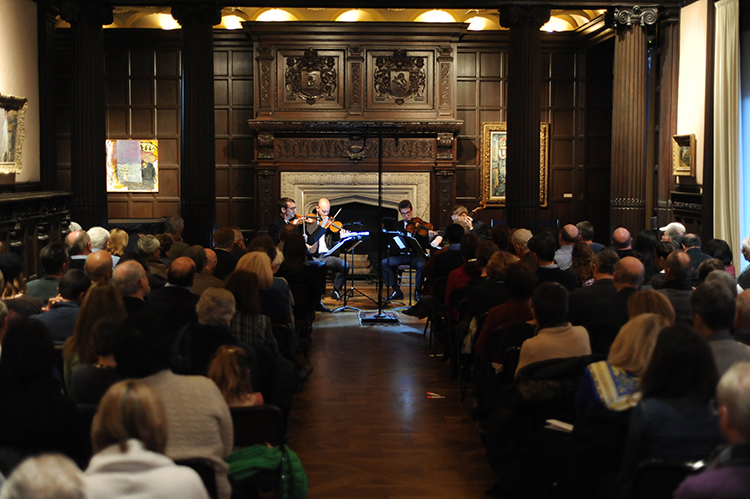 Those who were able to witness both the Calder Quartet’s performance in November 2013, and the Mivos Quartet Sunday, February 9, would have witnessed two very different performances of Arcadiana, a string suite by the British composer Thomas Adès (b. 1971). An inheritor of the 20th century tradition of Ligeti and others, Adès’s music creates allusions and connections to a musical past, whilst maintaining a thoroughly modern musical palette. The music of Arcadiana (composed when Adès was in his 20s, a year before his first opera, Powder Her Face) is loaded with literary and artistic significance, yet never burdened by it. Six of the seven movements evoke, in Adès’s own words, “various vanished or vanishing idylls.” The ‘idylls’ that he creates are in one breath rooted in the musical antecedence of what sounds like a quotation from Mozart or Schubert, and in the next uprooted, rushing floridly in another direction. Adès also draws upon the visual arts to inform his music: Nicholas Poussin’s Et in Arcadia ego, and Jean-Antoine Watteau’s L’Embarquement pour Cythère, both of which hang in the Louvre. This multiplicity of artistic reference and influence is never exhibited in an overtly programmatic way; rather they appear as opaque suggestions, ambiguous and unstable fragments of mythic realms and distant histories. The music of Arcadiana is minutely crafted and precise, yet in the hands of excellent players, can appear—with startling immediacy and clarity—as though it were unfolding before you for the first time. When a work of music contains such diversity and artistic depth, it can be deeply invigorating to hear two different groups of players, both equipped with the same musical means, realize its endless possibilities. Classical music programming is increasingly becoming a vibrant world of experimentation. The familiar paradigm of large Classical and Romantic works concentrated together in a comfortable succession has been shifting for some time. Many performers interject modern works between the old warhorses, illustrating the connections and similarities that unite often disparate sounding musical styles. 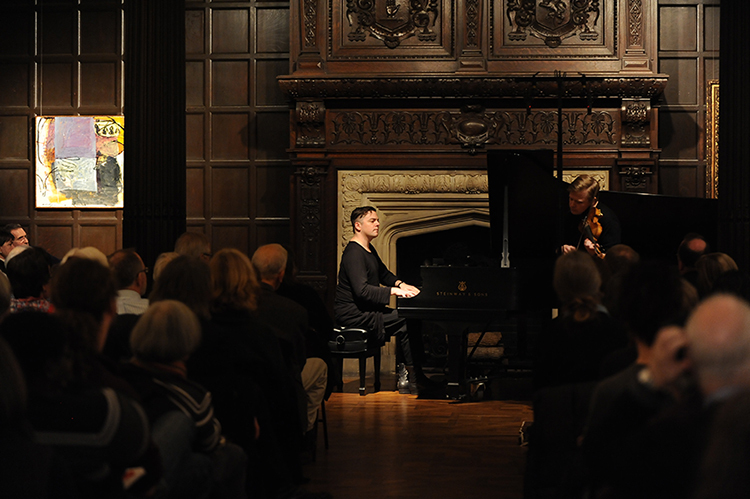 Some go even further as last Sunday’s performers, Pekka Kuusisto and Nico Muhly, did. Their program interlaced the movements of Bach’s partita for solo violin, No. 2, between works by Arvo Pärt, Philip Glass, and some of Muhly’s own chamber music. The effect created a musical thread, a journey for the listener in which each piece led naturally to the next with clarity of purpose and musical vision. Kuusisto and Muhly also spun their take on two traditional Finnish folk songs, music that felt entirely at home with that of Bach, creating the sense that all music shares a fundamental commonality. This simple, humble message was left to the audience to explore in any direction their imaginations chose to take them. Read Anne Midgette’s review of the concert in the Washington Post.